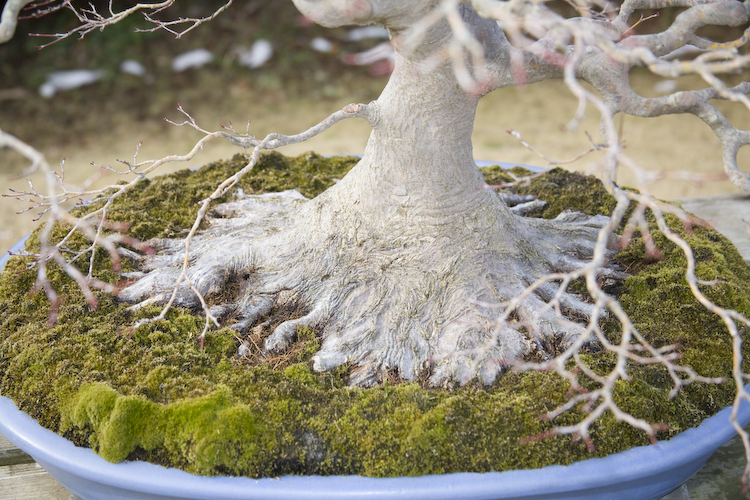 If you have been in bonsai for very long you quickly learn that having good nebari (root structure) adds significantly to the aesthetic and monetary value of your tree. But to be direct, in the US we don’t see that many trees with what we would classify as outstanding or incredible nebari. It takes work – and more work – and then some time. In 2008 we visited a individual (not to be named at his request) outside of Tokyo that was growing Japanese maples that made our jaw drop. Let me show you the first of a few. 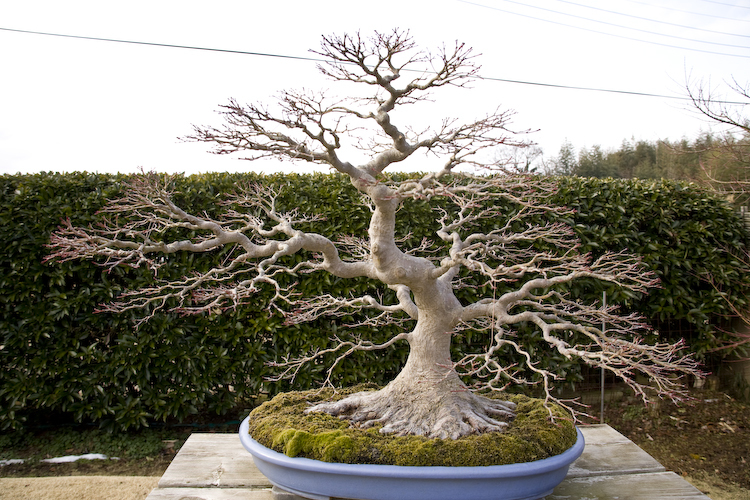 A nicely formed tree with the beginning of excellent ramification but with outstanding nebari. Just look at this closeup. 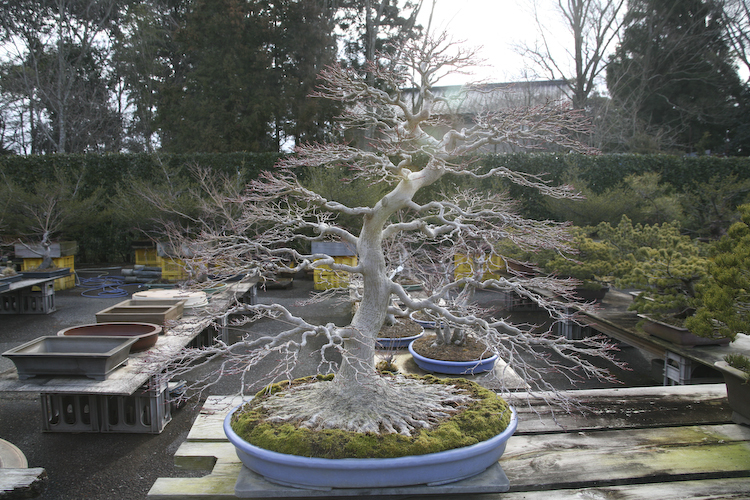 The owner of this tree indicated that when he repots his maples he takes about three days to do it. Why you might ask? He indicated that he very slowly combs out the roots and carefully positions them, in some cases pinning them in place, so that as they grow they begin to grow together and merge into this incredibly beautiful almost solid mass of roots. When I look at this photograph it reminds me of a candle where the wax has evenly flowed down to the base and spread out across the table. 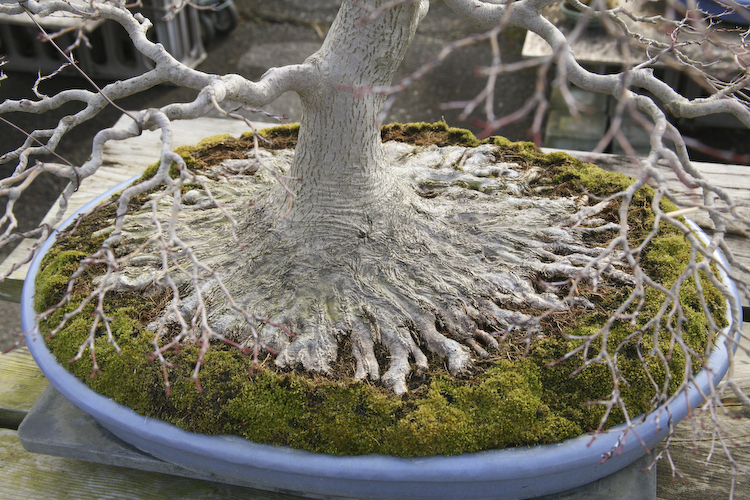 I’m going to also wager that he may have also grafted roots into this tree to accelerate this almost uniform nebari. To show us how well his technique worked he took us across the yard to show us another tree. 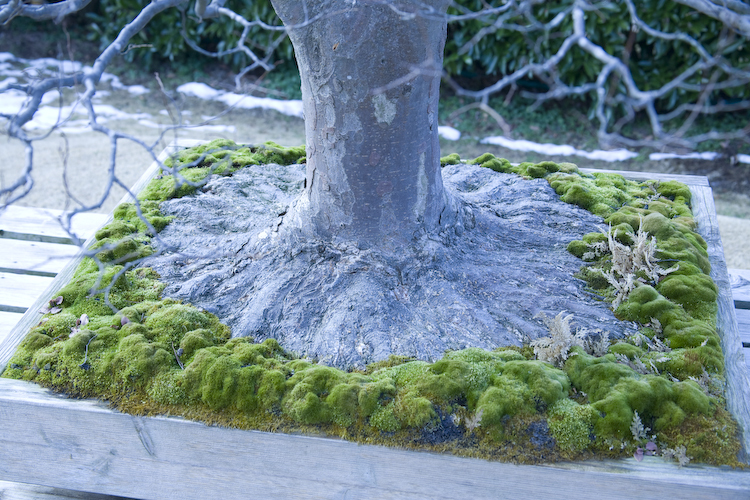 Let’s take a peek at the nebari on this zelkova. Nebari that is hard to believe. We must have stared at this tree for 10 minutes. Almost flawless nebari. To let you in on something not well know about this tree. The owner was offered $1 million for this tree. He declined. Today I wonder if it wouldn’t have been a good idea to have sold it. Thoughts? Well we continued to “wonder” (not misspelled) around the yard looking at the other Japanese Maples he owned. Frankly the nebari on this tree looks more natural to me with some undulation and unevenness in the length of the nebari. Which do you like the best so far? This is a fairly short tree. If you look carefully you can see where several large branches have been cut but have healed very nicely. It is hard to believe but this branch cut was healed in less than four years! We ask him how was this possible. He indicated that he watered the tree up to four times in the summer due to the heat and he fertilized the tree every three days. I often wonder if we simply don’t fertilize often enough in the U.S. He was using fertilizer cakes but was using liquid fertilizer for the frequent feedings. Ramification and every single branch wired. You can tell from the photo above that the owner takes the placement of each branch very seriously. Every single branch has been wired and positioned quite well. Do we take enough time to do this in America? We should. When we stumbled across a bench in the back of the yard it was full of small pots with trees like this below. 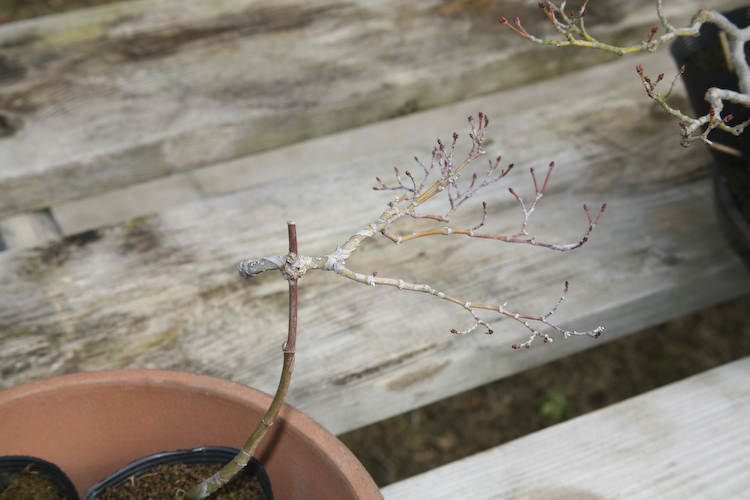 A Japanese Maple branch grafted on a very young tree. The owner explained that he has done numerous grafts like this in order to move branches on a tree to a more desirable location. I have seen thread grafts that can accomplish the same without a branch removal but this is very unique in that a nicely ramified branch (there were several – not this one) can be saved and moved to a more appropriate location on the tree thereby saving time (years) and improving the tree in less than 18 months. Most of these maples were for sale but the price wasn’t inexpensive. We saw one at the Green Club. Price was $25,000. 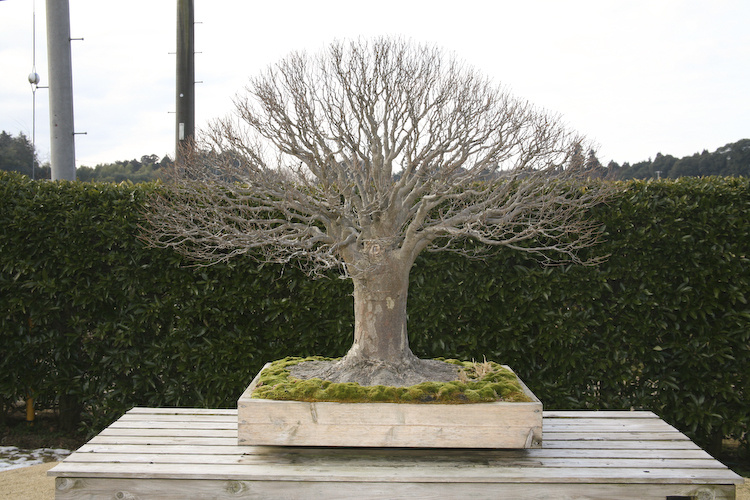 Lastly, I will try to locate the photograph but this owner has accomplished something unheard of in bonsai. He actually took a four inch section out of the trunk of a maple and then put the top and bottom sections back together again. It was nearly impossible to tell where the tree had been put back together again as there was only a very thin ring around the trunk. You might say – impossible. I would say we saw the photos of the process. Absolutely incredible. Thanks for the great pics. Do you know the purpose of the mesh wall in pic 8? 1 million and it’s not even in a nice pot. of the cut in half tree? I read about the Maple that had a section of trunk removed in a kinbon magazine about a year or so ago…. 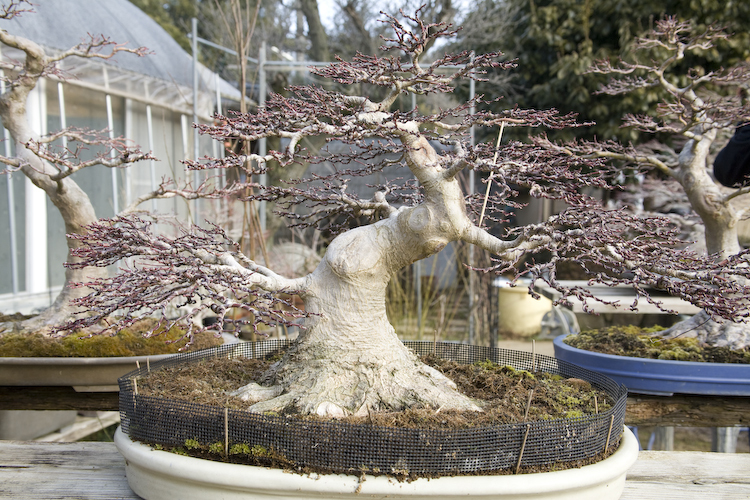 With any luck we might see it re-published in Bonsai Focus now that they seem to be translating articles again. Either way thanks for posting the pictures. His nursery is on my to see lists. Did he still have his young apprentice that spoke english? 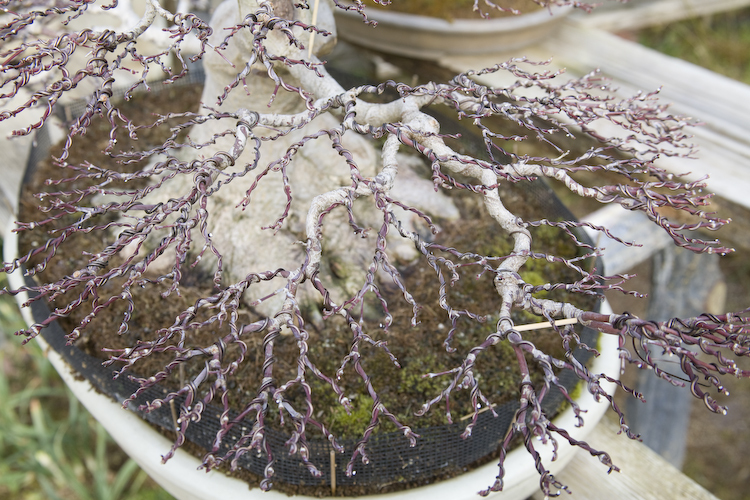 This individual is now quite ill and has had to sell all his bonsai. I am friends with his apprentice who told me this. Quite sad. Yes it is very sad. 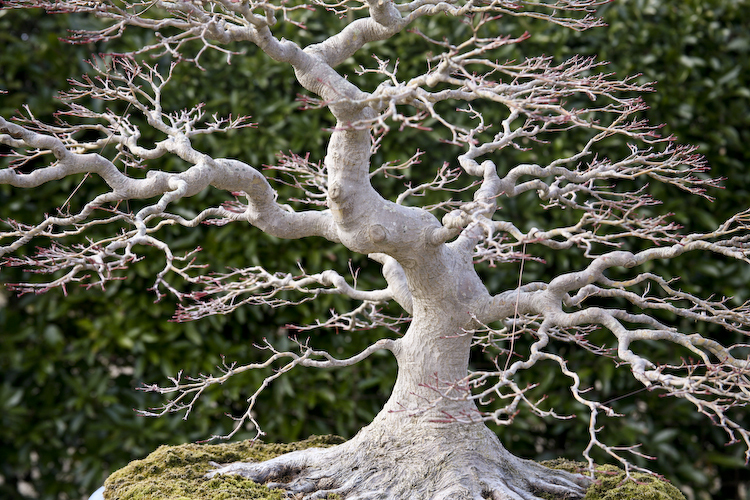 As a scientist who in later life turned his skills towards bonsai he was incredibly skilled at it with virtually no outside training. We continue to hope his health improves.